ASPEN POWER CATAMARANS. On the boat, from left: Natalie Holmes, Charlotte Holmes, Brandon Holmes, Chrissy Holmes and Otto Holmes. 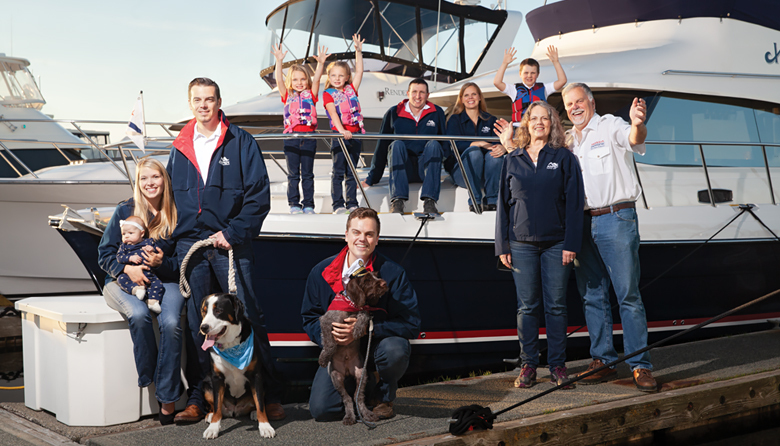 On the dock, from left: Sara Graf holding Peyton Graf, Nick Graf with Sucia, Steve Graf with Captain Duke, Cathy Graf and founder/owner Larry Graf. Aspen takes a direct-to-customer approach rather than selling through dealer networks. Buyers call, text or email Aspen and talk directly to technicians or a designer. Factory-direct dealing offers quicker innovations for product details. Graf helped pioneer power catamarans when, in 1987, he founded Glacier Bay Boats, which he sold around 2009. Now focused on Aspen, Graf enjoys hearing about his clients’ adventures, such as one owner’s taking a craft from Alaska to the Baja Peninsula, having it trailered across Mexico to Galveston, Texas, and then launching across the Gulf of Mexico and up the East Coast. “You typically wouldn’t do that with a 40-foot boat,” he says. The company uses two buildings in Burlington and about 80 feet of a dock in Anacortes to display its boats. Graf says one perk is working with two sons, a daughter and son-in-law among a tight-knit company of 32 employees.